JOIN US FOR NWA GIVES! We wanted to let you know that we are taking part in NWA Gives 2019, which is happening from 8am to 8pm on April 4th. NWAGives is a giving day for nonprofits across Northwest Arkansas. Please mark your calendar now and plan to support us with a donation on April 4th at our donation site HERE. On that day, you'll be able to find us and donate by going to NWAGives.org. Your gifts are essential to help us continue this important work! Join Us For Our Third Annual Golf Tournament Fundraiser! Register Your Team or Sponsor the Event: HERE! 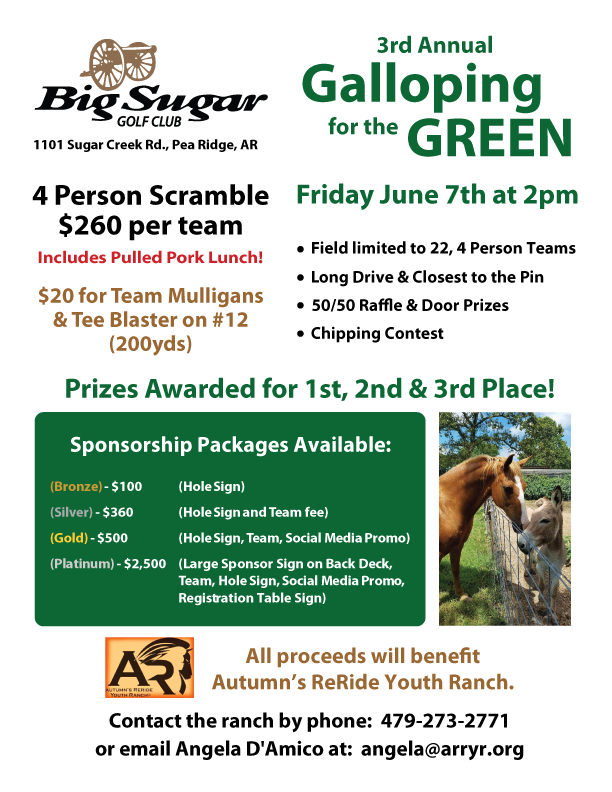 Autumn's ReRide Youth Ranch is a 501(c)(3) nonprofit organization located in Northwest Arkansas. The ranch provides a safe and peaceful environment where broken children, horses and families can find hope and peace within the healing glow of unconditional love freeing them from their troubles and sadness. As the transformation begins to unfold, the children and families begin to come, not always for what they can get (a rescued horse can not be ridden and has many of their own special equine needs) but sometimes for what they can give. 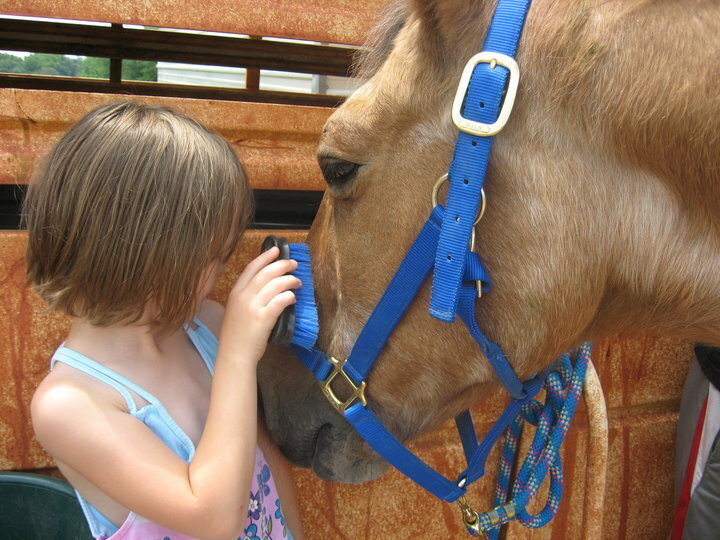 As the children work diligently caring for these struggling horses to help them get better, the children get better. There is something very spiritual about the bond that grows between the child and the horse; an unspoken language of complete acceptance. It is within the selfless and beautiful relationships between broken children and broken horses that one can witness miracles. These extraordinary horses, each of which have their own journey of hope and triumph, are paired with one leader and one child during a session. The horses have a unique past that gives them the ability to reach out to children in amazing ways. All participants learn the basics of riding, caring for horses and helping with ranch work. The sessions are flexible, allowing that time to best serve the unique needs of the children. Most riding sessions (on able-bodied equines) begin with a chore. This is usually 10-20 minutes where a leader and child work together mucking paddocks, pulling weeds, or working on various ranch projects. Each child is nurtured by a leader who shares his or her individual tears and triumphs. Involvement in these simple tasks builds value into the heart of a child. 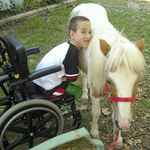 Often children and teens who visit Autumn's ReRide face special physical, mental, emotional or social challenges. Children have the opportunity to learn the values of life, family, work ethic, faith and to experience the healing bond of trust, confidence and accomplishment in a unique environment most would not otherwise have the opportunity to experience. The child may then develop a sense of pride and accomplishment. They, in turn, teach us true resilience and remarkable wonder of life. The children learn that they can do something to improve the life of another living being. This fills an elementary need in every child's heart. That is...the need to be needed. Often having this feeling of value is an integral part of a child's healing. Some use volunteering as healing. Many children benefit greatly from the riding session program, but are looking for more opportunities to be involved. The many volunteer children who routinely assist at the ranch are a wonderful asset! Having aged out of the foster care system, they yearn for purpose and place. Allowing them to volunteer outside of the session time provides them a place to be challenged and become a closer part of the ranch family. Children who choose to be more involved with labor work hand in hand with their adult counterparts, learning from their elders, witnessing the value of a hard day's work and exercising their bodies at the same time. Others come for the opportunity to volunteer to work with special needs children or rescued horses. All ages find their special place at the ranch; whether it is caring for horses, working with children, horseback riding, taking a walk on the property, or the opportunity to bask in a peaceful environment while sitting under the shade of a sycamore tree. All of this wonder, healing and hope is provided free of charge and volunteers have been building, cleaning, fixing and improving the ranch ever since it began, all without expecting anything in return.